In the previous chapter, we focused on the look and feel of our app, and got it looking nice and coherent. In the process, we also learned how to leverage Fuse's ux:Class mechanism to build reusable components for styling our app. In this chapter, we'll tie everything together and finish our app by adding the final screen - a splash page! This will set the mood for our app right away when the user opens it and is the last piece of the puzzle we need to match our design. And with all of the tools and techniques we learned in the previous chapters, it'll be a piece of cake. So let's get started! The full source code for the app is available here. Notice how we're using Page as a base class instead of the hikr.Page component we built last chapter. This is because we'll eventually add a video background to this page, so we'll just want app's background color for a background for now. With this saved, we should now see our blank SplashPage on screen! Note: We may have to restart our preview, as Fuse will cache which route we've navigated to between reloads. Restarting preview will clear this cache, ensuring our SplashPage is shown. And that's it; our title and slogan text are taken care of! Ah, but wait! Our hikr.Button component, because it was built from a Panel, doesn't actually have a FontSize property. But this is no problem, we can just build it ourselves! This way, unless otherwise specifed, the value of our FontSize property will be 16 like it was before. Awesome! Now that we've got our SplashPage's JS module set up and a Clicked handler for our button, we can implement this handler properly so it will navigate to our HomePage. However, if you recall from our Navigation and routing chapter, we'll need our component to have access to one more thing in order to perform navigation - our app's Router instance! With that done, we can save everything and test it out to make sure it works! Note, however, that we're using the Router's push function here. Ideally, we would be using goto, as it doesn't make much sense for a user of our app to navigate back to the splash screen during normal use. However, to make things easier for us to test, we can use push for now so we can navigate back for the time being, and swap it out with a call to goto later. Before we stick this in our app, it's important to note where this video came from. This video is a modified version of Graham Uhelski's "The Valley", which is licensed under the CC BY 3.0 license. This means we can share and adapt the content as we please, even in commercial purposes, as long as we provide attribution to the original artist. This requires us to give appropriate credit to the original author, and indicate if changes were made. So, it's important that we do this once we get the video in the app. Note: Always use content in your apps that you know you have the rights to. Never ignore content licenses, especially when they're this easy to follow! And with that, we've got our content attributed properly and looking great! Now, the video is only displayed within the bounds of the SplashPage. Easy! And that's everything! Now, our SplashPage is complete. Looks like we've made it to the end! 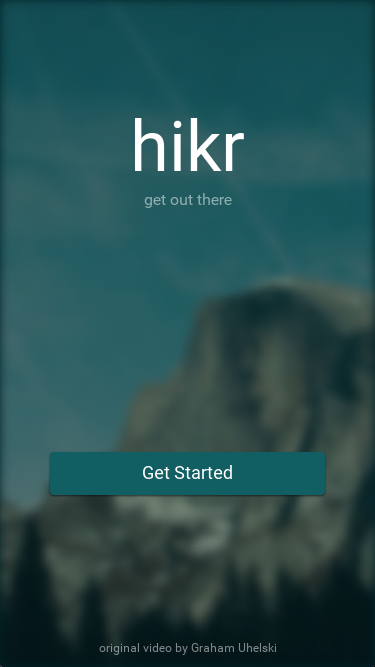 Our hikr concept app is completely finished. Awesome! Now that our app is finished, we've already covered many of the core concepts of Fuse, but there's always more to learn. The final chapter will be a quick wrap up about what we've learned and where we can go next to improve our Fuse skills. So let's check it out!